Ever get awakened by a child crying and say to yourself, "That kid's got a healthy set of lungs"? They are still growing, too. My father could make himself heard from quite a distance, and I inherited that — which paid off when I preached in a big old church that did not have a working amplifier. 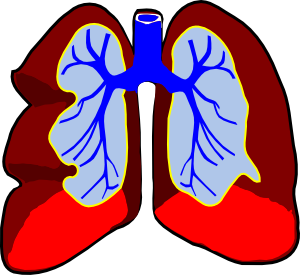 While lungs are extremely important, they are not the only part of our respiratory system. Indeed, the specified irreducible complexity of the Master Engineer's work confounds the hands at the Darwin Ranch. Ain't no way all the parts can come together through random processes and chance and still have all those intricate functions. Well, let's sniff around with that aspect. We breathe in our air, exhale carbon dioxide (which plants love and return the favor by making oxygen), and keep cells working through our blood supply. However, there are impurities that need to be removed. Some of that gets caught in the nose (or expelled through sneezing), and our parts of our respiratory system get involved in cleaning things up. There are many fascinating aspects of our intricate respiratory system. Our Creator has given us many comparisons where he uses terms about air, breath, and so on in Scripture. While secularists may claim that EvolutionDidIt, such a claim can be dismissed by thinking people. To read the entire article, click on "The breath of life".